As hard as it was to believe, Wednesday was my last night in Buenos Aires. I knew I wanted to go somewhere special but also a place that wasn’t stuffy or too formal. As I had dined at various places, I had asked the chefs, cooks and servers where they go on their day off, with many of them citing the same place – Las Pizarras Bistro in Palermo Soho. I had been told to make sure to get a reservation so I booked a table for 9PM. At first I had thought this was a pizzeria, given the name and the last thing I wanted was another terrible slice of za. 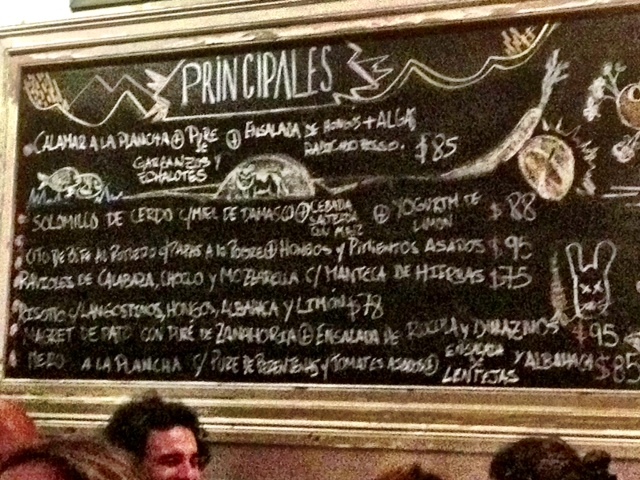 However, the word pizarras actually means, more or less, a blackboard. It became very obvious why it was called Las Pizarras as soon as I entered the room. Given it’s a place for the locals, there was no English translations but by now, I could pretty much decipher any Spanish language menu. It was once again incredibly hot so I opted for a glass of cold Torrontes to start. 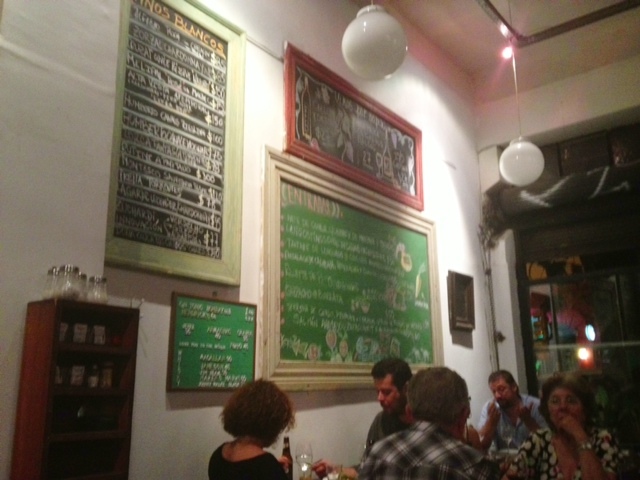 The restaurant was right up my alley – small, cozy with an open kitchen and extremely reasonable prices. My eye was immediately drawn to the marget de pato (duck breast), which was about half of the cost of the one She Who Shall Not Be Named had at Casa Umare. This seemed like the perfect way to exorcise those demons. 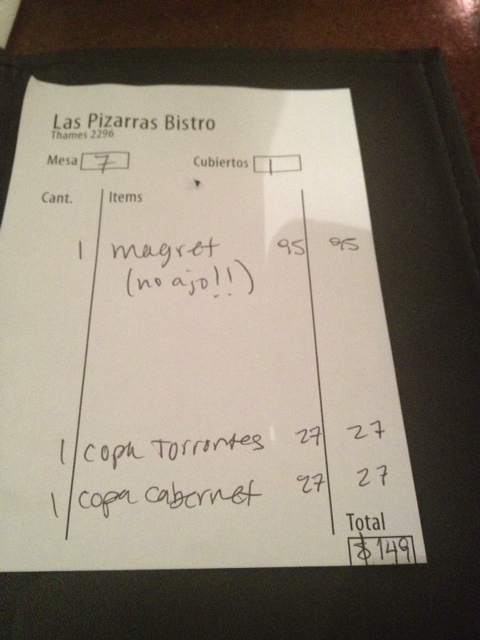 My server, who turned out to a girl who had recently moved there from Michigan, recommended the Cabernet Sauvignon. What was soon presented to me turned out to be hands down the single best dish I had in Buenos Aires. The fat on the duck breast had been perfectly rendered and thankfully well seasoned. It was a perfect medium rare and tender. 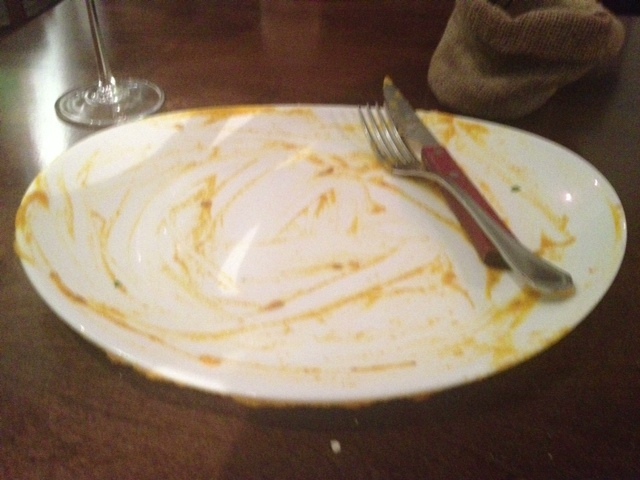 However, what set this dish apart was what came with it. 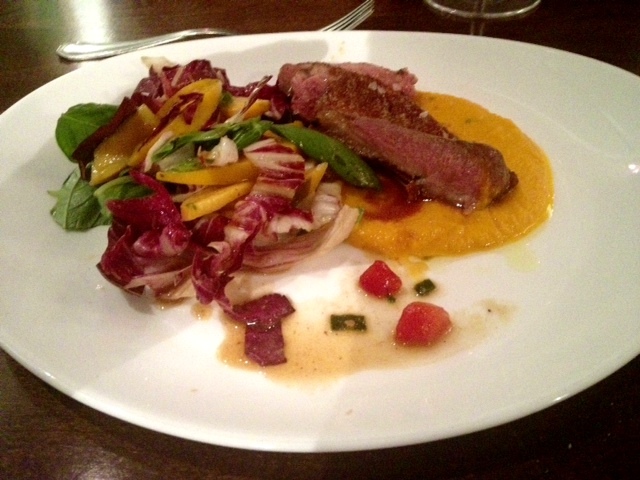 Underneath the duck was a fantastic puree of carrots and ginger. Even better was the salad next to it. A fascinating blend of flavors of grilled arugula, fresh peaches and a truly memorable dressing of Dijon mustard, veal stock (wow), and Himalayan pepper, it elevated the dish to “blackout goodness” as Anthony Bourdain likes to say. 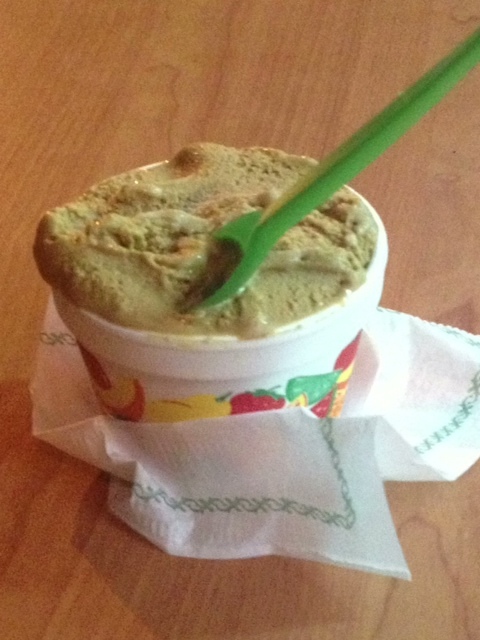 It was now 11PM but still 82 degrees and muggy so instead of having dessert there, I walked down a few blocks to the first place I had ice cream in Buenos Aires, Fillipo. I had wanted to try their delicious dulce de leche for awhile, especially since they gave you the option of having a cup vs. those terrible sugar cones, which causes a mess. It was just what I needed. Since I was fairly close to Plaza Serrano, I thought it would be fine to take one last stroll through there. The plaza was extremely packed and buzzing with energy. I later found out that the next day was a national holiday so it made sense that people were out partying. 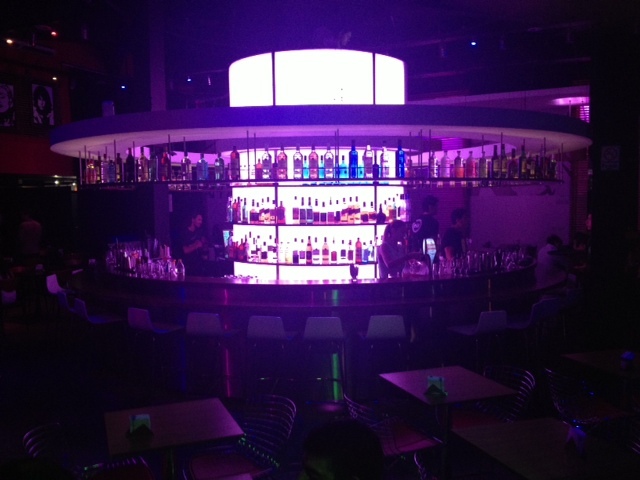 I ended up at a funky large bar called Club Serrano since they were having 2×1 drinks. I ordered a mojito, which unfortunately turned out to be godawful. It was way too sweet and the mint was barely muddled. I choked down about half of it and then asked the bartender for some soda. That took the sickeningly sweet tasted out of it but it needed more lime so I asked for that next. Finally, I had him do a quick toss, and voila!, an actual mojito emerged. The music was eclectic to say the least – bouncing from 80s pop – Frankie Goes to Hollywood “The Power of Love” (? ), to smoooth R&B – Sade – to modern dance – with seemingly no rhyme or reason. For my second drink, I opted for a caiprihna, which was much better. Suddenly, the music got turned up and the large doors were shut, blocking my nice view of the Plaza. It was DJ Electro Cheeze time and the music got much, much worse. There was a cavernous second room, which was the club part of venue. The crowd was pretty young and wasn’t really my scene so I bailed. Plus, tomorrow was a big day with a switch to a new locale, Mendoza, so I decided to get at a few hours of beauty sleep.